Here’s some Good Joss for the first day of Summer for you — or Winter for all our good friends on the other side of the Equator — from new tangler Patty Mercer of North Carolina. ‘Good Joss’ is a colloquial expression for good luck that I heard while in the Orient… which is how I feel about stumbling across Zentangle! 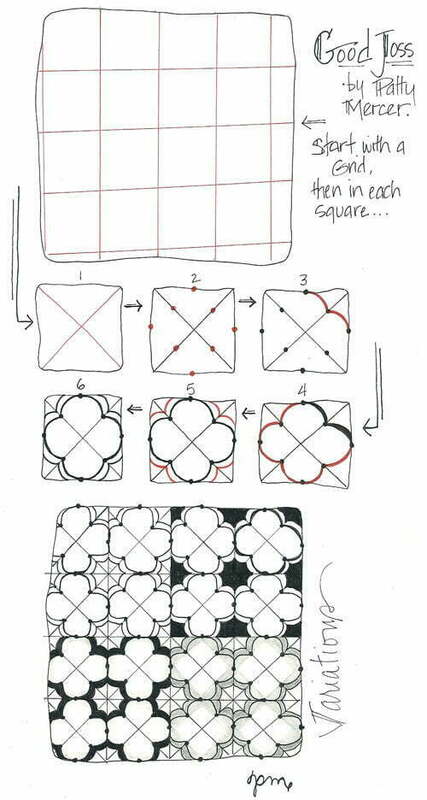 Good Joss is another grid-based tangle and while it reminds me a little of Elena Hadzijaneva’s Tesali, especially with this variation, it is nonetheless different both in the strokes within the grid’s squares and in the method of drawing the tangle too. I am a closet illustrator and a proficient doodler who keeps a a sketchbook close by at all times, but I am new to tangling. In my business (brandzilla.net), I create professional logos and marketing design but this type of creative outlet is truly meditative in nature and relaxing and inspiring all at the same time. My natural tendency is to draw from a grid, I think my mind is geometrically organized like that but I love the combination with organic patterns. Here are Patty’s step-by-step instructions for drawing Good Joss and a montangle of four variations for you to try. Check out the tag pattym for more of Patty’s patterns on TanglePatterns.com. Have a safe and happy summer (or a safe and cosy winter), y’all! Your tangle reminds me of puffy clouds. Since I love doing grid patterns, I’ll enjoy adding this one to my list. Thanks so much for sharing.